HEALTH TIP: Frankincense and myrrh are produced from closely related species of balsam trees. Frankincense is derived from the Boswellia tree, while myrrh is derived from the Commiphora tree. Both species of trees originate in the mountains of south Arabia (Yemen and Oman) and mountains of Somalia. For thousands of years, practitioners of traditional medicine have valued frankincense and myrrh for their potent healing properties. The Queen of Sheba brought great quantities of frankincense & myrrh as gifts for King Solomon. Why? …. Frankincense contains boswellic acids which are anti-inflammatory and treat arthritis, colitis, & Crohn’s disease. Researchers at Virginia Tech’s college of veterinary medicine recently discovered that frankincense is effective at treating skin cancer in horses. Frankincense is “carrier oil” in that it penetrates membranes and cell walls. It is one of the few substances known to cross the blood barrier. A cancerous cell wall loses its ability to transfer substances across the membrane. Therefore, not all herbs or medications can effect a cancerous cell. However, “carrier” agents like frankincense, DMSO, and very alkaline minerals like cesium are highly penetrable across the membranes and have the opportunity to act on a cancerous cell or a brain tissue that is separated by the blood brain barrier. 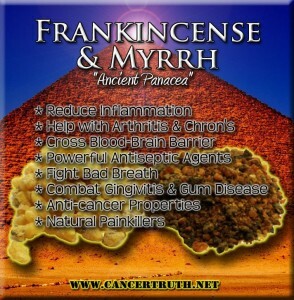 Frankincense has been clinically researched to combat cancer and for use as an antidepressant. It is commonly used in European hospitals. Frankincense is being researched for its ability to simulate human growth hormone production and to assist in hormone balance. As you can see, the uses of frankincense are so numerous that it can accurately be described as a “panacea,” used for everything from colds to cancers. Myrrh is similar to frankincense in its wound-healing and blood-vitalizing properties, and the two are often combined in salves. Like frankincense, myrrh resin is a predominant part of the immune system of the tree. Therefore, many of the therapeutic functions of myrrh are quite similar to frankincense. Myrrh is a specific and highly effective antiseptic astringent for inflammations of the mouth, throat, and gums. It is also an effective treatment for chronic halitosis, gingivitis, and periodontal disease. It is a common ingredient of herbal tooth powders and mouthwashes, and is widely used throughout the Middle East and India for dental problems. Researchers at Rutgers University have found two compounds in myrrh that are strong painkillers, another compound that helps lower cholesterol, and most recently, a potent anti-cancer agent. What makes myrrh such an exciting player in the anti-cancer field is not only how well it kills cancer cells in general, but how it kills those that are resistant to other anti-cancer drugs. “The myrrh compound definitely appears to be unique in this way; it is working where other compounds have failed,” says Dr. Mohamed M. Rafi, an assistant professor in the department of food science at Rutgers. Myrrh has been shown to be selectively toxic against MDR (multiple drug resistant) tumor cells found in the breast and prostate. Myrrh is believed to work by inactivating a protein called Bcl-2, a natural factor that is overproduced by cancer cells, particularly in the breast and prostate. When levels of this protein go too high, say experts, it not only promotes the growth of more abnormal cells, it can also make those cells resistant to anti-cancer drugs. In Dr. Rafi’s laboratory research, the myrrh compound was able to inactivate the protein in a line of breast tumor cells known as MCF-7, cells that in the past were particularly resistant to treatment. The Greeks considered frankincense and myrrh to be “sacred substances” and those who could afford these resins used them as incense and to treat virtually every illness.